Welcome to THE VETTE NET, a very proficient and knowledgeable online Corvette brokerage company. Since 1998, we have provided our professional broker services to the USA and worldwide Corvette community, assisting both buyers and sellers with their transactions. We look forward to adding you to our long list of happy clients. 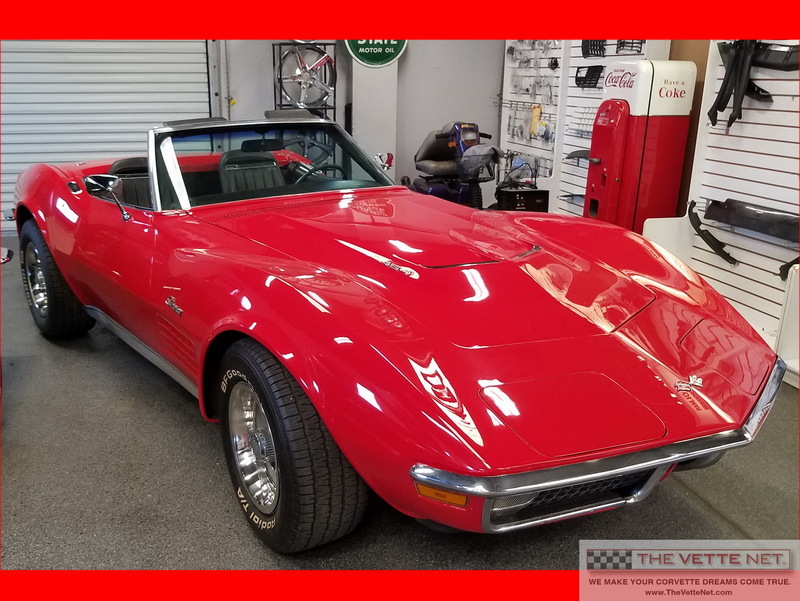 Our offer today is a desirable Big Block 1971 Convertible endowed with the 454 engine rated at 365HP. It comes very well equipped with Automatic transmission, Power Steering, Power Brakes, tilt and telescopic steering wheel, Hard Top. Engine looks original to the car and has the proper cast, date, VIN and CPJ suffix on the engine pad signifying factory 454/365 auto configuration. Engine was rebuilt some 4000 miles ago and performs flawlessly. Engine compartment is pretty much correct (ignition shielding, air cleaner, plug wires) and it benefitted from the addition of Aluminum radiator with thermostat-controlled electric fans. It is mated with the Automatic transmission. Vacuum system is fully functional, headlights and wiper door work, wipers work as they should. Undercarriage is looking fresh and in very good condition. Interior has period correct Leather seat covers, new carpet, door panels...The Convertible soft top will be installed new with the choice of color selected by the buyer (White, Black or Tan). The Hard top comes with the car, it was just painted and is now being re-assembled as seen in pictures. Located in FLORIDA, we can assist with delivery nationwide and all over the world. Corvette trades are considered, also assistance with financing is provided.